The goal of coal mining is to obtain coal from the ground. 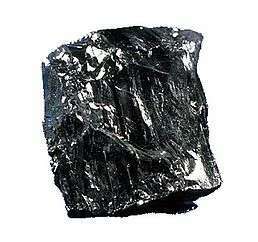 Coal is valued for its energy content, and, since the 1880s, has been widely used to generate electricity. Steel and cement industries use coal as a fuel for extraction of iron from iron ore and for cement production. In the United Kingdom and South Africa, a coal mine and its structures are a colliery. In Australia, "colliery" generally refers to an underground coal mine. In the United States "colliery" has historically been used to describe a coal mine operation, but the word today is not commonly used. Small-scale mining of surface deposits dates back thousands of years. 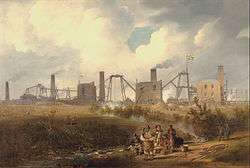 For example, in Roman Britain, the Romans were exploiting all major coalfields (save those of North and South Staffordshire) by the late 2nd century AD. 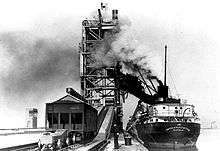 While much of its use remained local, a lively trade developed along the North Sea coast supplying coal to Yorkshire and London. Children would usually work as trappers; this is where they had to open and close trap doors to allow mine carts in. This made sure no harmful gases built up in the mine. 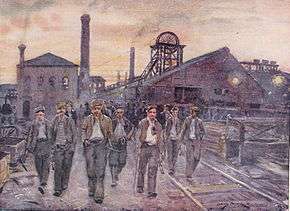 The oldest continuously worked deep-mine in the United Kingdom is Tower Colliery in South Wales valleys in the heart of the South Wales coalfield. This colliery was developed in 1805, and its miners bought it out at the end of the 20th century, to prevent it from being closed. Tower Colliery was finally closed on 25 January 2008, although production continued at the Aberpergwm drift mine owned by Walter Energy until suspended on 3 July 2015. When coal seams are near the surface, it may be economical to extract the coal using open cut (also referred to as open cast, open pit, mountaintop removal or strip) mining methods. 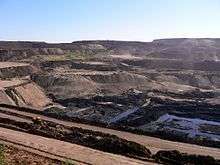 Open cast coal mining recovers a greater proportion of the coal deposit than underground methods, as more of the coal seams in the strata may be exploited. Large open cast mines can cover an area of many square kilometers and use very large pieces of equipment. This equipment can include the following: Draglines which operate by removing the overburden, power shovels, large trucks in which transport overburden and coal, bucket wheel excavators, and conveyors. In this mining method, explosives are first used in order to break through the surface, or overburden, of the mining area. The overburden is then removed by draglines or by shovel and truck. Once the coal seam is exposed, it is drilled, fractured and thoroughly mined in strips. The coal is then loaded onto large trucks or conveyors for transport to either the coal preparation plant or directly to where it will be used. Most open cast mines in the United States extract bituminous coal. In Canada (BC), Australia and South Africa, open cast mining is used for both thermal and metallurgical coals. In New South Wales open casting for steam coal and anthracite is practised. Surface mining accounts for around 80 percent of production in Australia, while in the US it is used for about 67 percent of production. Globally, about 40 percent of coal production involves surface mining. 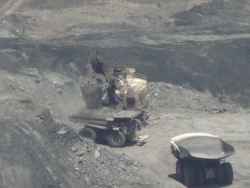 Continuous mining utilizes a Continuous Miner Machine with a large rotating steel drum equipped with tungsten carbide picks that scrape coal from the seam. Operating in a “room and pillar” (also known as “bord and pillar”) system—where the mine is divided into a series of 20-to-30 foot (5–10 m) “rooms” or work areas cut into the coalbed—it can mine as much as 14 tons of coal a minute, more than a non-mechanised mine of the 1920s would produce in an entire day. Continuous miners account for about 45 percent of underground coal production. Conveyors transport the removed coal from the seam. Remote-controlled continuous miners are used to work in a variety of difficult seams and conditions, and robotic versions controlled by computers are becoming increasingly common. Continuous mining is a misnomer, as room and pillar coal mining is very cyclical. In the US, one can generally cut 20 ft or 6 meters (or a bit more with MSHA permission) (12 meters or roughly 40 ft in South Africa before the Continuous Miner goes out and the roof is supported by the Roof Bolter), after which, the face has to be serviced, before it can be advanced again. During servicing, the "continuous" miner moves to another face. 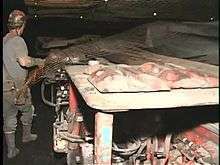 Some continuous miners can bolt and rock dust the face (two major components of servicing) while cutting coal, while a trained crew may be able to advance ventilation, to truly earn the "continuous" label. However, very few mines are able to achieve it. Most continuous mining machines in use in the US lack the ability to bolt and dust. This may partly be because incorporation of bolting makes the machines wider, and therefore, less maneuverable. Coal reserves are available in almost every country worldwide, with recoverable reserves in around 70 countries. At current production levels, proven coal reserves are estimated to last 147 years. However, production levels are by no means level, and are in fact increasing and some estimates are that peak coal could arrive in many countries such as China and America by around 2030. Coal reserves are usually stated as either (1) "Resources" ("measured" + "indicated" + "inferred" = "resources", and then, a smaller number, often only 10-20% of "resources," (2) "Run of Mine" (ROM) reserves, and finally (3) "marketable reserves", which may be only 60% of ROM reserves. The standards for reserves are set by stock exchanges, in consultation with industry associations. For example, in ASEAN countries reserves standards follow the Australasian Joint Ore Reserves Committee Code (JORC) used by the Australian Securities Exchange. In the United States, the increase in technology has significantly decreased the mining workforce.The average number of employees at U.S. coal mines decreased 12.0% to 65,971 employees, the lowest on record since EIA began collecting data in 1978. As the number of coal workers has decreased, a study caused controversy as GreenTech Media pointed out that investment for the retraining all coal workers for solar jobs was modest - one year of coal CEO pay could retrain every US miner to work in the solar industry. Improvements in mining methods (e.g. longwall mining), hazardous gas monitoring (such as safety-lamps or more modern electronic gas monitors), gas drainage, electrical equipment, and ventilation have reduced many of the risks of rock falls, explosions, and unhealthy air quality. Gases released during the mining process can be recovered to generate electricity and improve worker safety with gas engines. Another innovation in recent years is the use of closed circuit escape respirators, respirators that contain oxygen for situations where mine ventilation is compromised. Statistical analyses performed by the US Department of Labor’s Mine Safety and Health Administration (MSHA) show that between 1990 and 2004, the industry cut the rate of injuries by more than half and fatalities by two-thirds. However, according to the Bureau of Labor Statistics, even in 2006, mining remained the second most dangerous occupation in America, when measured by fatality rate. However, these numbers include all mining, with oil and gas mining contributing the majority of fatalities; coal mining resulted in only 47 fatalities that year. The Japanese archipelago counts four main islands, the richest coal deposits have been found on the northernmost and the southernmost island: Hokkaidō and Kyũshũ. Coal has come under continued price pressure from natural gas and renewable energy sources, which has resulted in a rapid decline of coal in the U.S. and several notable bankruptcies including Peabody Energy. On April 13, 2016 it reported, its revenue tumbled 17 percent as coal price fell and lost 2 billion dollars on the previous year. It then filed Chapter 11 bankruptcy on April 13, 2016. The Harvard Business Review discussed retraining coal workers for solar photovoltaic employment because of the rapid rise in U.S. solar jobs. A recent study indicated that this was technically possible and would account for only 5% of the industrial revenue from a single year to provide coal workers with job security in the energy industry as whole. 1 2 Smith, A. H. V. (1997): "Provenance of Coals from Roman Sites in England and Wales", Britannia, Vol. 28, pp. 297–324 (322–4). ↑ National Archives, UK. "19th Century Mining Disaster." ↑ "Jobs to go as South West Wales coal mine is mothballed". South Wales Evening Post. 2015-06-26. Retrieved 2016-08-20. ↑ MCCartney, Martha W. (1989). "Historical Overview Of The Midlothian Coal Mining Company Tract, Chesterfield County, Virginia." Archived April 19, 2007, at the Wayback Machine. December 1989. 1 2 Christman, R.C., J. Haslbeck, B. Sedlik, W. Murray, and W. Wilson. 1980. Activities, effects and impacts of the coal fuel cycle for a 1,000-MWe electric power generating plant. Washington, DC: U.S. Nuclear Regulatory Commission. ↑ "Coal Mining. World Coal". World Coal Institute. 10 March 2009. 1 2 U.S. Department of the Interior, Office of Surface Mining Reclamation and Enforcement (1987). Surface coal mining reclamation: 10 years of progress, 1977-1987. Washington, D.C.: U.S. Government Printing Office. ↑ U.S. Environmental Protection Agency, Philadelphia, PA (2005). "Mountaintop mining/valley fills in Appalachia: Final programmatic environmental impact statement." 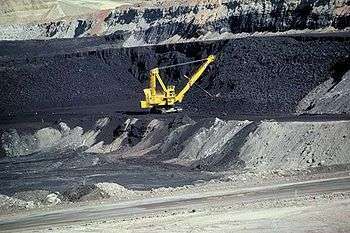 1 2 [http://www.worldcoal.org/pages/content/index.asp?PageID=92> "Coal Mining. World Coal"]. World Coal Institute. 10 March 2009. ↑ "Coal Statistical Review 2010". ↑ Engelbert, Phillis. "Energy - What Is A "Miner's Canary"?". enotes. Retrieved 18 August 2010. ↑ "Former Miner Explains Culture Of Mining." NPR: National Public Radio. April 7, 2010. ↑ Coal Mining Fatalities 1900-2014, US Dept. of the Interior, MSHA. ↑ "Coal Mining Steeped in History". ABC News. January 5, 2006. ↑ OccupationalHazards.com. "Respiratory Protection in Coal Mines." ↑ US Mine Safety and Health Administration. "Statistics - Coal Mining Fatalities by State - Calendar Year." ↑ "Census of Fatal Occupational Injuries Summary, 2006 Washington D.C.: U.S. Department of Labor". Bureau of Labor Statistics. (2006). ↑ "Panel to Explore Deadly Mine Accident". New York Times. Associated Press. September 4, 2007. ↑ Coal mining fatalities, US Mine Safety and Health Administration, accessed 27 June 2016. ↑ Urbina, Ian (2010-04-09). 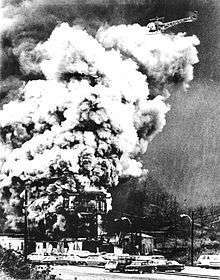 "No Survivors Found After West Virginia Mine Disaster". New York Times. ↑ Abelard.org, "Fossil fuel disasters". ↑ Krah, Jaclyn; Unger, Richard L. (7 August 2013). "The Importance of Occupational Safety and Health: Making for a "Super" Workplace". National Institute for Occupational Safety and Health. Retrieved 15 January 2015. ↑ U.S. Department of the Interior. 1979. Permanent Regulatory Program Implementing Section 501(b) of the Surface Mining Control and Reclamation Act of 1977: Environmental Impact Statement. Washington, D.C.: U.S. Department of the Interior. ↑ US Energy Information Administration, International energy statistics, accessed 29 Dec. 2013. ↑ "The Importance of Coal in the Modern World - Australia". Gladstone Centre for Clean Coal. Archived from the original on 2007-02-08. Retrieved 2007-03-17. ↑ "Australia Mineral Statistics 2009- June Quarter" (PDF). Australian Bureau of Agricultural and Resource Economics. Archived from the original (PDF) on 7 July 2011. Retrieved 3 October 2009. ↑ "September 2015 - Resources and Energy Quarterly" (PDF). Australia Office of the Chief Economist. September 2015. pp. 44, 56. Retrieved 3 October 2015. 1 2 WCA (September 2014). "Coal Statistics". Today in Energy. World Coal Assocoiation. Retrieved 3 May 2015. ↑ "Where The Coal Is Stained With Blood." Time, March 2, 2007. ↑ Kasuga Yutaka, Transfer and Development of Coal-Mine Technology in Hokkaido, pp.11-20. ↑ "BP Statistical review of world energy June 2007". BP. June 2007. Archived from the original (XLS) on 6 February 2009. Retrieved 22 October 2007. ↑ Schmidt, Stephan. "Coal deposits of South Africa - the future of coal mining in South Africa" (PDF). Institute for Geology, Technische Universität Bergakademie Freiberg. Retrieved 14 January 2010. ↑ "Coal Mining". World Coal Institute. Retrieved 14 January 2010. ↑ "Coal". Department of Minerals and Energy (South Africa). Archived from the original on December 2, 2009. Retrieved 14 January 2010. ↑ "Coal Mining in Taiwan (ROC) - Overview". Mbendi.com. Retrieved 2014-05-26. ↑ The White House, Washington, DC (2008). "President Bush Attends 2008 Annual Meeting of the West Virginia Coal Association." President George W. Bush Archives. Press release, 2008-07-31. ↑ Lomax, Simon (2011-02-09). "'Massive' Closures of U.S. Coal Plants Loom, Chu Says". Bloomberg Business Week. ↑ Matthew Brown (March 17, 2013). "Company eyes coal on Montana's Crow reservation". The San Francisco Chronicle. Associated Press. Retrieved March 18, 2013. 1 2 Riley, Charles; Isidore, Chris. "Top U.S. coal company Peabody Energy files for bankruptcy". CNNMoney. Retrieved 2016-04-13. Department of Trade and Industry, UK. "The Coal Authority". Archived from the original on 2008-10-13. Retrieved 2007-10-16.